Strategically located at a prestigious technology park which houses several major international media outlets as well as Israel’s Government Press Office, the new office is home to two CAMERA affiliates. 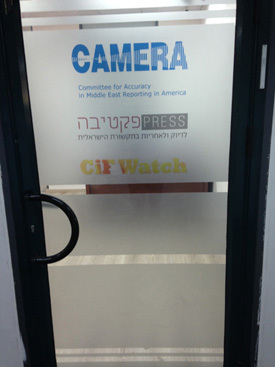 Presspectiva (www.presspectiva.org.il), CAMERA’s popular Hebrew-language website launched in 2010, will share space with the influential CiF Watch (www.cifwatch.com), which monitors the Guardian and other British media outlets. BBC Watch (www.bbcwatch.org), CiF Watch’s sister site, will continue to operate from its branch in northern Israel. CAMERA, Presspectiva, CiF Watch and BBC Watch are responsible for securing countless corrections in leading print and broadcast outlets on key subjects such as Palestinian prisoners, Israeli policies towards the Gaza Strip, United Nations resolutions, sensitive holy sites, and many others. Staff members regularly communicate with journalists and publish op-eds and letters to the editor which clarify and focus on topics frequently misrepresented by mainstream media reporting.